Between the end of the forties and the mid-sixties, a series of experiments was conducted in Australia aimed at transforming the computer CSIRAC into a musical instrument, able to compose and execute music tracks. The history of this experiment it can be read by following this link, and in this article I want to write briefly about another goal reached during those experiments, namely the development of one of the first music software, the Music Programme. In the article on CSIRAC I explain that the Australian research took place in some respects earlier than in experiments conducted in the United States at Bell Labs, while other aspects, such as the Music Programme, the work took place concurrently or otherwise over a period of time so close that it is not easy to establish who first reached certain goals. The musical experimentation with CSIRAC took place in two stages: in the first, between 1949 and 1955, the CSIRAC was in Sydney, and is then moved and installed in Melbourne where he remained until 1964. 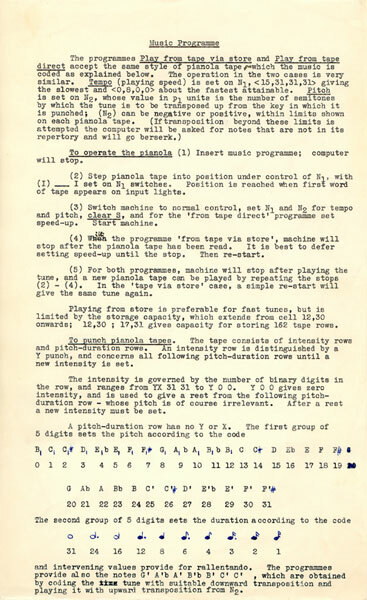 It was during the latter phase, in 1957, that the mathematician Thomas Cherry, dealing firsthand experiments on the machine Australian music, he decided to develop a music software that would facilitate the use of the computer: the Music Programme. The instructions for the Music Programme of Cherry. The Music Programme was designed for those who had no computer skills but knew the traditional musical notation, so that they could use it to interact with the machine, writing real musical scores. The process by which it was possible the operation was rather simple, with the eyes of today. 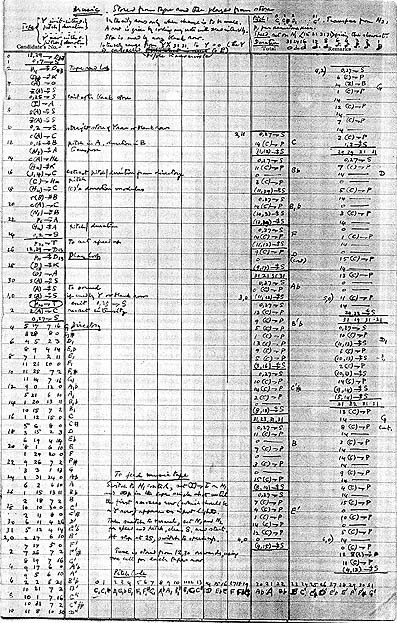 Cherry had arranged the program by creating a symbolic relationship between notes, note duration and arbitrary numbers. If you wanted to play a semibreve, for example, you typed the number 31, for a minim the number 16 and so on up to cover all durations. The same principle for the definition of the notes, selectable by entering a number between 0 and 20. The performance of the score could be done either by reading data from a memory, whether reading a punch card. The music implications between the one and the other methodology were substantial, as in the first case it was possible to perform pieces of limited duration, which depended on the size of the memory. However, the use of memory did not involve issues of speed, in fact, using the punch card was possible to perform songs of any duration but the execution speed depended on the speed of the punched cards reader. Writing of Cherry’s software becomes inevitable compare what he was doing at the same time of Max Mathews at Bell Labs with the Music I. The differences between the two programs are important, as Mathews possessed DACs that allowed him to get a better overall tone of that of the Music Programme. On the other hand, not having to perform any conversion work but generating the sound in a direct manner, the Music Programme allowing listening in real time, while the Music I was forced to hours of latency due to the conversion from digital to analog. Although the Music Programme and experimentation with CSIRAC not have known the same lucky fate of Max Mathews and his Music N, the fact remains that goes to Australia, the primacy of the first music made through a computer, and maybe even the record the first music software in the history of computing. Doornbusch, Paul; Computer Sound Synthesis in 1951: The Music of CSIRAC, Computer Music Journal, Vol. 28 , 2004, pp. 10 – 25. Doornbusch, Paul; The Music of Csirac: Australia’s First Computer Music, Common Ground Publishing, 2005. ← Are you an audio detective?